Discovery Shop manager Michelle Galvez (standing, right) with volunteers Sandra Romero, Randolph Romero, Anne Ellingwood and Michelle Hale. Photo by Daniel Deitch. 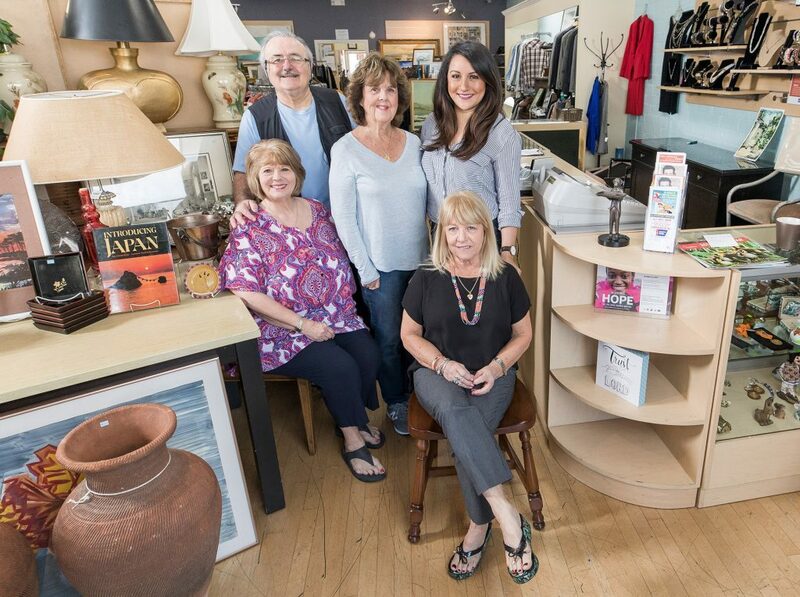 For a fun and easy way to reduce your environmental footprint while supporting a worthy charity, look no further than Toluca Lake’s own American Cancer Society Discovery Shop on Riverside Drive. 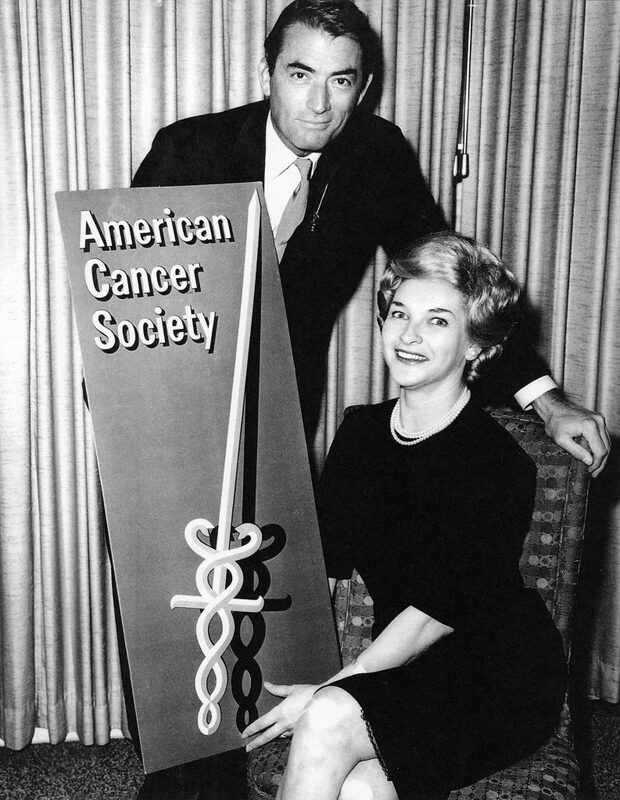 Discovery Shops founder Denise Noel poses with Gregory Peck, who served as the American Cancer Society’s national chairman in 1966. Photo courtesy of Toluca Lake Discovery Shop. The very idea has local roots: Seeking a way to raise money for cancer research after losing her mother to the disease, Encino resident Denise Noel founded the first Discovery Shop in 1965. The innovative concept — an upscale, volunteer-run resale store offering gently used clothing and other donated items, with all proceeds benefiting ACS — caught on quickly, and today there are 40 Discovery Shops throughout California and dozens more across the nation. The Toluca Lake Discovery Shop was opened in 1996 by original manager Amy Widener, with Bob Hope and Fritz Coleman cutting the ceremonial ribbon. (Coleman returned to celebrate the Discovery Shops’ 50th anniversary in 2015 and the Toluca Lake location’s 20th in 2016.) The store has evolved over the years, now selling items on eBay and marketing itself through social media and email, but it remains a steadfast neighborhood presence. Clothing, books and furniture are the top sellers, but the shop sees plenty of jewelry, purses, paintings and collectibles as well. Volunteers research any unusual or potentially valuable items and set designer and vintage goods aside for semiannual “Only the Best” sales, which draw big crowds and thousands of dollars in revenue. The store’s occasional gallery-style art sales have also been great successes. Interested in volunteering at the Toluca Lake Discovery Shop? 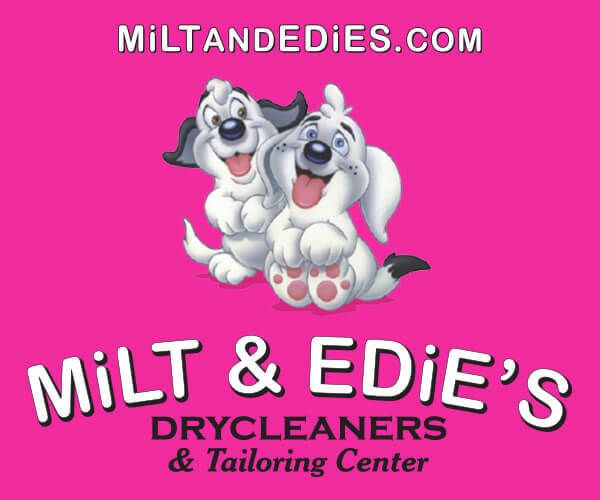 Stop by the store and talk to Michelle Galvez.